For every challenge we face, there is a solution. Your World is passionate about empowering our viewers for positive change through the grace of God. 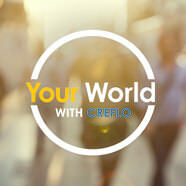 We invite you to tune in weekly as Creflo Dollar takes us into the world of his guests, and discovers how God can and did impact their lives. Creflo sits with world-famous rapper, Lil Boosie, to talk about his life on the streets, his bout with cancer, and the importance of trusting in God fully through all things. Creflo sits with Algee and his step-father, John, to talk about the important role that all fathers play in the lives of their kids.